Distortion has been at the root of almost every rock and rock influenced musical style since the 1950's. It is a rarity to find a guitarist who is not, at the least, vaguely familiar with use of distortion in guitar application. 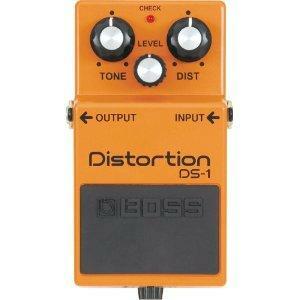 Distortion is typically applied through a distortion pedal/effects unit or the amplifier itself. What exactly is distortion you ask? It's very difficult to answer this question without employing the help of your ears; the video below will certainly help. It's almost like trying to describe the color of red to a person who has been blind their whole life. Distortion, in musical terms, is the alteration of a sound wave. When a single note (or tone) is played on a guitar our ears recognize it by the number of vibrations. Although we don't know how many times it vibrates, we can tell the difference between the "High E" and "Low E" on a guitar. Higher notes have more vibrations over a given time period vs. lower notes. This number of vibrations give us an audible blueprint that helps us to distinguish between different notes. These vibrations, in graph form, resemble repeating waves on the ocean. They have curves that go up and down in a smooth fashion. If we take those smooth curves and change them into straight lines with hard angles and bends, the waves look dramatically different.....and they sound different too! That noticeable change is referred to as distortion. This phenomena is reproduced in distortion pedals and amplifiers. Distortion is generally described as being "buzzy" or "fuzzy", although legions of guitarists would agree that distortion can be harnessed to produce some very pleasing results. Distortion & Overdrive are often used interchangeably, but the difference is truly in the names. True overdrive pedals are designed to push (drive) the tubes in a tube amplifier. When tubes are pushed in this manner, distortion is created. Overdrive pedals are sometimes referred to as "boost" pedals. Distortion pedals, on the other hand, distort the line level signal that is coming from your guitar before it gets to the amp. Can a distortion pedal also drive the tubes in a tube amp. Definitely. There is somewhat of a consensus in the guitar community that the sonic properties of a tube amp "pushed" are noticeably different than a distortion pedal (or overdrive pedal) running through the clean channel of a solid state amp. Tube amplifiers are often described as "warmer" vs. solid state amps when it comes to distortion. From a clean channel standpoint, the differences between tube and solid state amps may not be even noticeable at moderate volumes. In fact, if you mainly play clean, there may not be a need to invest in a more expensive tube amplifier. Tube amps are routinely chosen for rock, blues, & metal music because the tubes distort in a rather pleasing manner.....you'll often hear references to harmonic overtones & sustain in this kind of discussion. Distortion & Overdrive pedals tend to incorporate the same functions. You'll typically see drive, tone, and level buttons. Drive is generally the amount of distortion added, tone is obvious, and level is the relative volume level of the pedal vs. the amp. Numerous guitarists set the level of the pedal identical to the volume of the amp; this is referred to as "Unity Gain". Conversely, some guitarists will set their distortion pedal level slightly higher than the volume of the amp so they have a volume "boost" during solos. Whether it's distortion or overdrive, experiment as much as possible and let your ear decide!! !